With 1500kms road kilometres to ride, it was off with the knobblies and on with the slicks. I was planning on averaging 120kms a day, but ended up riding up to 150kms to give me time to ease off for the fabled Icefields Parkway - between the national parks of Jasper and Banff. I generally try not to rush, but winter is encroaching and snow threatens on the Great Divide Mountain Bike Ride, which is the next phase of the journey south. Now that Dan’s back in Montana resuming his studies, I’m riding alone. He’s been great company – chilled, adventurous and really easy to get along with. 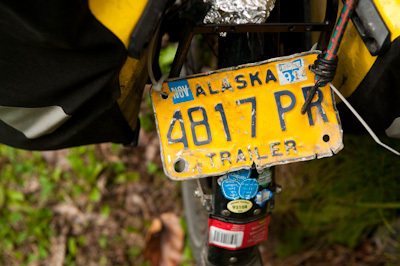 Indeed, the last 3500 kilometres together have been really good ones – the epic Haul Road to the Artic, our fantastic singletrack loop in the Kenai Peninsula, and Canada’s Yukon. Good times. See you in Bozeman Dan, for the long awaited Big Night Out! I know it will take time adjusting to being back on the road by myself, but I also know it will be good for me to cover this distance to Banff alone. There’s a definite sense of strength and independence earned from complete self sufficiency, and having no one to rely on but yourself; it’s empowering. On the downside, I won’t be able to share my experiences. Motivation can be a challenge when you’re by yourself, and there’s no one to seek reassurance from – all the decisions have to come from within. And it can be very lonely too. 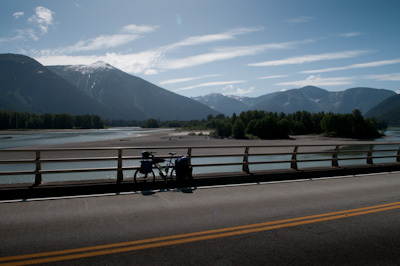 On the first long day out of Prince Rupert, it felt like I barely uttered a sound – the lone cyclist can be starved of conversation and hungry for words. Alone or lonely? It can be hard to tell which is which sometimes. 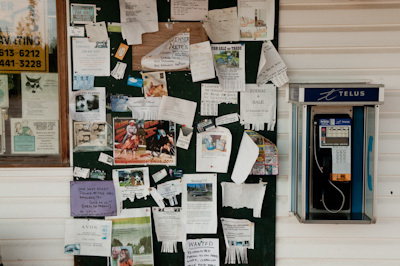 I like checking out what's on the noticeboards of diners, gas stations and small town grocery stores - they offer little insights into the day to day goings on of these communities, and tell stories of their own. These days, I try and be on the road for 8am, giving me the whole day to ride and relax. I don’t have a cycle computer set up yet, so I keep an eye out for the kilometre posts. They’re marked in 5km intervals, which is good, as it gives a pleasing sense of progress with each one that passes. In my head, I’m continually doing the maths. 120Km at 5km intervals, that’s 24. If I do 140km for six days, that will save me a day. And then I wonder why I’m rushing. I meet someone; I chat for longer than I ‘should’; I enjoy the conversation. And I think: who cares where I get to. I’m not here to be on a schedule but to follow my instincts, to tune into them again, and to let them lead me wherever it feels right. It can be a fine balance; staying motivated and focused on covering the distance ahead – a task that can sometimes feel overwhelming -without closing yourself off to spontaneity and chance. By day, I listen to podcasts; storytelling, the news that I download as I travel, comedy shows. They inspire me to ride on. At times, the perfect right track will play as the sun flickers through the forest leaves, or as I crest a hill, and during these moments, the whole world seems to slot into place. At night I camp, listening to the rhythmic clunk and whir of the train going by, whose rails rarely seem far away. I lie down, read or write until the light drops and darkness envelopes the words. I know I’ll sleep well. The start of the ride itself, apart from a blustery headwind by the lakesides, is stunning. 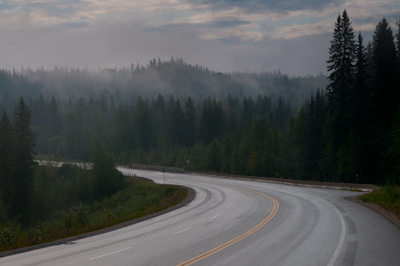 Highway 16 has a generous shoulder on which to seek sanctuary from cars, Rvs and trucks. 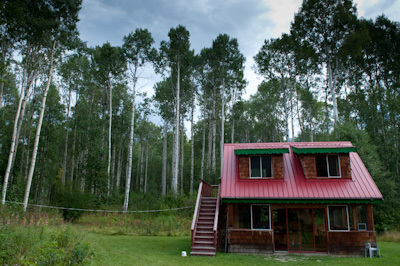 It meanders between the broad Skeena River and the train line to Jasper. As I ride, I crane my neck to either the massive cedars on one side, or the bare, sheer limestone rockface on the other. White cap peaks poke out behind, adding a real sense of scale to the happenings down below. From Terrace, the kilometres feel more repetitive. An endless run of cattle farms and lakes and high mountains and pastures and forest and rolling hills. Smooth tarmac unravels before me and I ride quickly, enjoying the speed. Approaching Smithers. This is farming country, and the landscape is punctuated with enormous wooden barns and ranches. Small towns appear occasionally. Old fashioned advertising billboards announce their outskirts, adorned with 50s typeface and washed out images. Each house seems to host a fleet of cars in various states of working disorder. 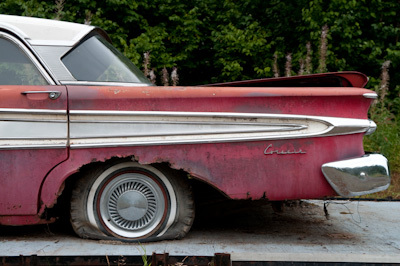 Some are curvy Cadillacs from the 50s, others sport dramatic sharkfins. Several sprout long grass from their windows. I like their colours: faded cobalt blues, lime greens and caramel browns. Much of this land is made up by reserves granted to the First Nations. Past the Totem poles of Moricetown, I watch locals dip-netting, drawing a ready supply of plump, thrashing salmon from the waters – easily a dozen each in a matter of minutes. 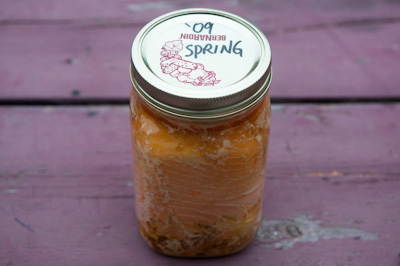 This is prime salmon time: for locals, who smoke or can them for the winter, visiting fishermen from the States, and of course, hungry bears fattening up before the winter hibernation. In New Hazeltown, Joy and Sherry invited me in for dinner at the campsite. The menu? The finest spring salmon and basmati rice. Lovely! They even sent me off with a generous helping for a picnic the next day. The closer to Prince George I become, the more trucks and RVs seem to whoosh by, sucking me momentarily forwards and towards them like a fishing boat in the wake of a liner. Sometimes the heavy traffic and incessant noise gets me down. So many cars, so many trucks. The world seems so dependent on them; bicycling seems futile. 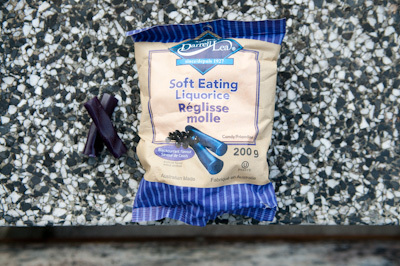 But just when the distance ahead seems almost insurmountable and my legs and mind are tiring, an experience livens up the spirits once more: an unexpected, enriching conversation with a passer by, or a small but thoughtful gift at grocery store – some juice, a piece of fruit. In many ways, I love the quiet existence of cycling alone, and how satisfying it is in its simplicity. 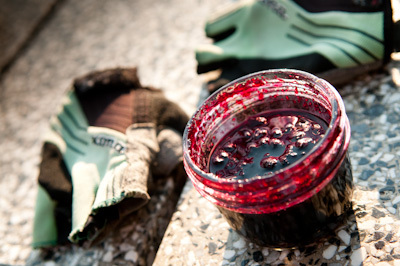 There’s a deep sense of contentment born from focusing on the simple things life; biting into a sandwich for lunch, or slipping, exhausted, into my sleeping bag at night. At other times, it’s harder to deal with. I dwell, I ponder, I imagine conversations in my head, playing through different outcomes. Sometimes thoughts are sulphurous. I lift of old stones in my mind and see what’s under them. I question why I’m doing this, and what I’ve left behind. It can be hard to steer my way back to the moment, to clear the clutter and find the present. In many ways, the challenge of riding each and every day feels like trying to meditate. The mind moves quickly and restlessly, yet progress is slow. Adjusting to this pace of life takes time and patience. Resisting the urge to continually hurry on to the next destination can be hard. As I head inland, the skies cleared and the sun beat down. The outskirts of Vanderhoof are marked by an enormous timber mill, and the air is palpably heavy with the odour of raw, freshly cut pine and spruce. Trees plucked of their branches and leaves lie in huge piles; an enormous machine with a lobster-like claw picks them up as effortlessly as I would hold a matchstick, feeding them into the mill. A hundred metres later they re-emerge, transformed into equally large piles of planks, as high and deep as the structures they’ll be used to build. This part of British Columbia is very much dependent on the timber industry, and I’m told that the recent economic downturn, and the ensuing effect on building houses, has hit the region hard. 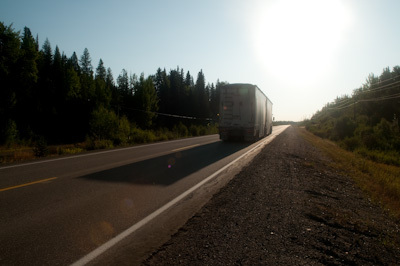 A timber truck thunders past as I fix a puncture - my first in 4500kms. In Prince George, I stay with Richard and Maggie, who are part of the cycling hospitality organisation Warm Showers, welcome cyclists into their home. 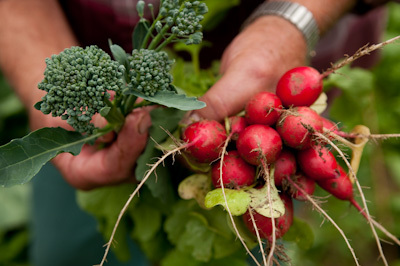 They feed me wonderful, fresh food, from a garden full of lush vegetables. It’s a fun, quirky household; when I come back from shopping for provisions for the days ahead, I find Richard in the midst of a reading from Monk – the obsessive compulsive detective – for Maggie and a neighbour who are busy peeling apples – a jam and pies production line. The following morning, I enjoy a yoga and chi gong class in their very own yoga room, the perfect pre-breakfast, pre-ride start to the day. 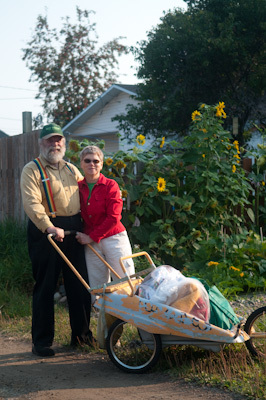 Children's author Richard and teacher Maggie lead a car free life, which is saying something in Canada. Their house is full of creativity; a splash of colours and papier mashe animals, like the bookshelf in the shape of a giraffe, and the magazine rack that resembles a Zebra. With his volumous beard and stripy braces, Richard cuts quite a character. 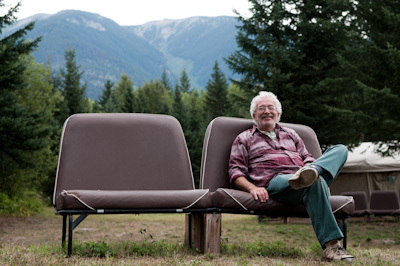 I camp 130km out of Prince George in a rest area – a clearing with picnic benches and toilets. Info panels give me the lowdown on the area. The nearby Necha-Koh, one of the main tributaries of the salmon-bearing Fraser River, has long been an important corridor for First Nation people, who used to catch fish in nets made of roots, scrape hides for clothing, and hunt deer and moose. There’s a deep sense of connection between man and land, and one sentence resonates strongly: letting the earth heal itself. Giving the earth a rest so the berries will grow again and the fish will multiply. That morning I bump into Tom, riding a Surly Long Haul Trucker. 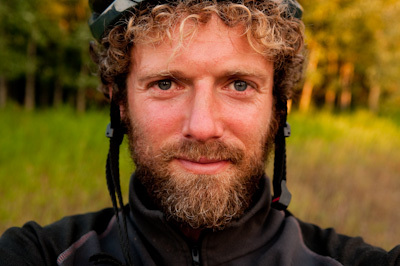 He’s been on the road for several months, cycling in Russia, Mongolia and China. Lean and strong, he’s covering enormous distances – and has a 200 miler planned to get him to Prince Rupert on time for a ferry ride. 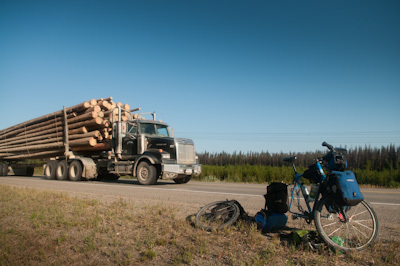 Then, just out of the cute town of Mcbride in the Robson Valley, I meet Matt, 25, from Chicago, also on a Long Haul Trucker. Matt started in Deadhorse, Alaska, and is working his way south until his money runs out. We ride along together that afternoon, chatting easily, and both end up staying at an address he’s been given by someone he met down the road. 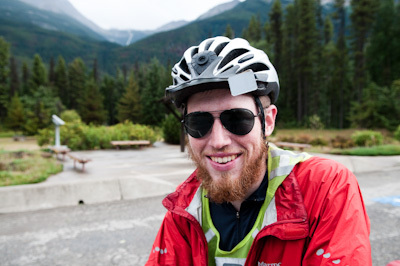 With his strong features and squared-off beared, Matt had the looks of a cycling rabbi. In fact, his parents are both missionaries. I thought his quiet but deep and resonant voice would be perfect for radio. On the long descents, he donned his Ray Ban Aviator copies for bug free riding. Matt has also been working his way south from Alaska. Destination? As far as his legs and money will take him. It’s an address that leads us to Pete’s Place, a veritable haven if ever I saw one. 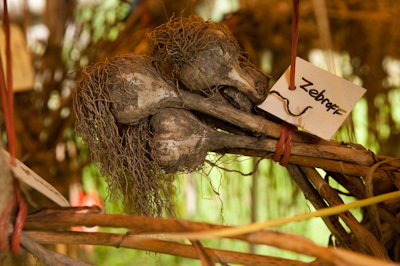 The grounds exude a mellow vibe and are abundant in organic produce; dotted around the land is an old school bus and caravans for volunteers or travellers to spend their nights. We spend a wonderful evening exploring all the nooks and cranies, and grazing off all the vegetables that sprout from the earth – carrots, potatoes, dill, parsley, turnips, brocolli, basil, garlic, peppers, squash, raspberries, strawberries, the list goes on and on. ‘The greenhouse and garden comes first, and I come second,’ Pete comments, as he shows us around with obvious pride, keen for us to sample everything we see, and pleased we’re enjoying the food so much. ‘Sometimes people are too busy making a living to enjoy life,’ he says. Pete. A man of warmth and generosity, with a real sense of community. 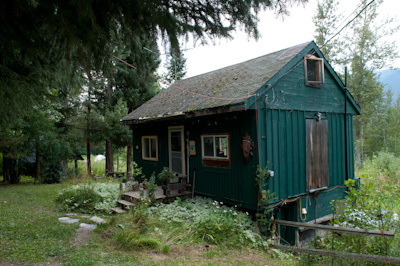 The abode where he welcomes in stray cyclists and anyone who wants to stop and help out on his organic farm. 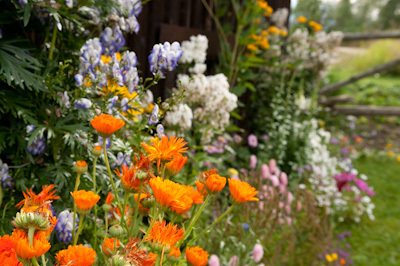 Pete is a seed saver, and grows 160 varieties of tomatoes, as well as all kinds of garlic. The next morning, Pete takes us down the road to the tiny, time-captured grocery store at Dunster; named after Dunster in Exmoor – one of my favourite spots for mountain biking back in the UK. The setting is beautiful: an almost idyllic community settled in the folds of this fertile valley. Apparently a number of hippies moved here in the 70s, and almost every garden seems abundant in flowers, seclusion and food. Dunster post office and grocery store. When the railroad was built, the stops along the way were named after placenames in England. 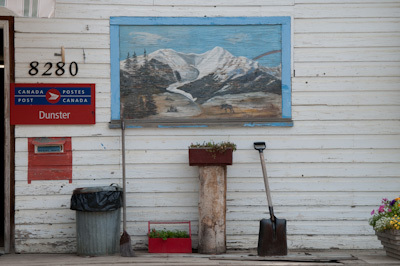 The people of the Robson Valley are certainly a green-fingered lot. The houses there are often open plan, and a have a wonderful, natural feel to them. It’s hard to leave, but after lunching on fresh jam and food harvested from the garden (and, on Pete’s insistence, filling our panniers with vegetables for the days ahead), we push on. 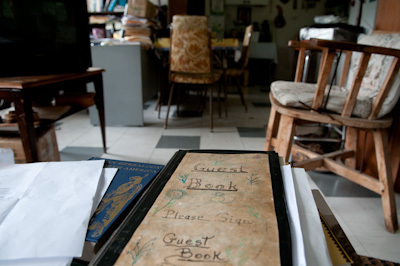 First though, we sign his guestbook, which we notice has been going for over 40 years. 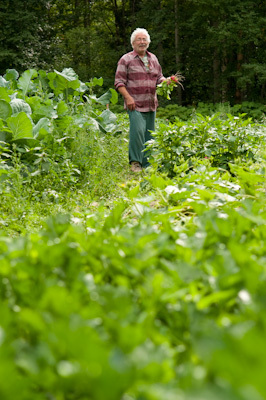 As part of the Wwoofing scheme (World Wide opportunities on Organic Farms Workers), Pete’s Place is busy with Europeans working and travelling their way around Canada over the summer. There’s a list of house rules, and one catches my eye: Please feel free to speak your mind in a graceful way. Nicely put, Pete! Pete's been welcoming in people to his home for over 40 years. 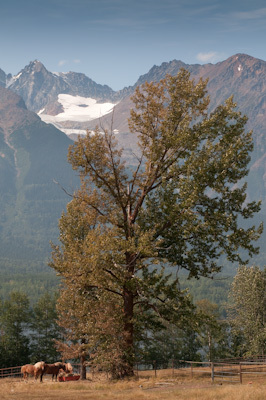 This entry was posted in BC and Alberta on September 10, 2009 by Cass Gilbert. Amazing reading Cass. Tam said she wants to pop over and join you to make sure you are not lonely! As an avid cyclist for the past 30 years, I can’t tell you how much I have enjoyed your web site. Our little gang of riders now range in age from 50 on up; however, they are daunting in their devotion to cycling. We have biked the world together; trekked to base camp in Nepal, slept outside by the geysers in Yellowstone in winster, hiked the Inca Trail, etc., etc. It is our passion. 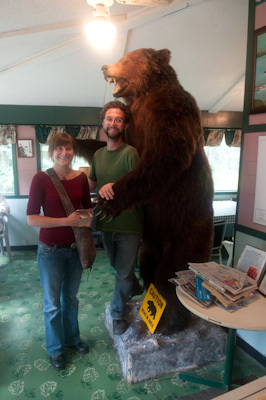 Should you ever find yourself in Minnesota, we will provide you with lodging in several places in the state. Awesome lifestyle!!!! Thanks Mary! I’m glad you’re enjoying the site. If you’re short of ideas of where to ride next, I have some ideas! I wiil retrace your ride from Prince Rupert to Jaspers in July, starting in Vancouver, Vancouver Island and the ferry to Prince Rupert. 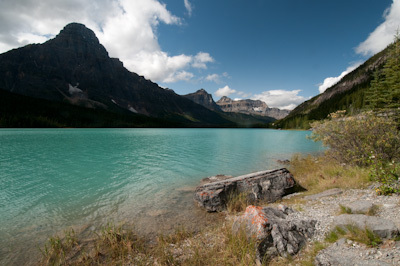 Do you have any recommendation on bike routes back to Vancouver after riding the Parks to Banff and Radium? Most everyone turn south into Glacier NP, but I have that route several times. Im flying from Long Beach Ca. 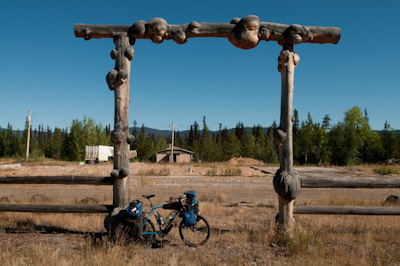 to Prince Rupert on August 5th, from there I will cycle to Jasper or some where near there. 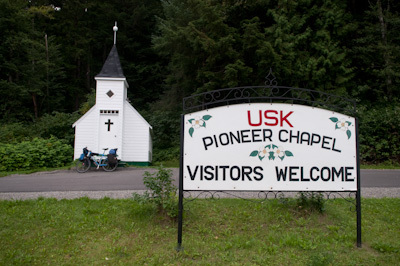 I googled cycling from Prince Rupert, and your entry popped up. You are in for an incredible ride. I completed Vancouver Island, the ferry to Prince Rupert, the The Yellow Head to Jasper, the Ice fields to Lake Louise then back to Vancouver on the Trans Canadian and parallel roads — all in 3 weeks last July 2013. How do you fly into Prince Rupert? 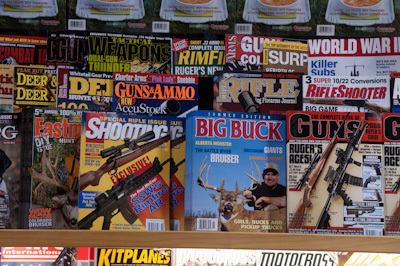 Its a small town with a big dark secret — Big Coal, Big Oil and Big Lumber. If you haven’t confirmed your reservations, you may consider taking the ferry from Vancouver — its a high point. I put some photos of the Ice fields under my name on crazyguyonabike.com. If you have any questions about the ride, email me at scott@dcabinets.com. Thanks for the enthusiam. I have a flight to Prince Rupert from Ling Beach Ca. I have friends who have done the ride. One as done a fer times. Is the traffic better out of Vancouver Is? That is what seem to be implying.